Diamante Spas was founded in 1977 and based in Ontario, California by U. S. Tooling & Spas, Inc. 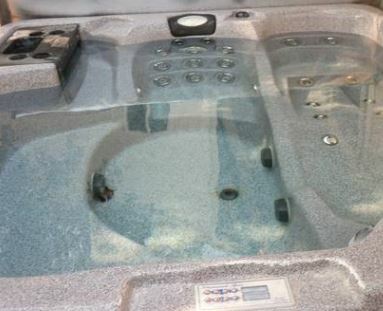 They manufactured hot tubs and aquatic fitness systems (swim spas) They no longer manufacture hot tubs, but Hot Tub Outpost carries replacement spa parts and accessories for Diamante Spas. Some of the Diamante spa filter systems included the 240 sq.ft. Ultimate Filtration System with 2 cartridges side by side in the horizontal skimmer. Many of these spas used 24 hour circulation pumps. Heaters used included the NT-4000 heater. The concept behind this heater is that the element does not touch the water (NT is no touch). So it works by heat transfer from within a stainless steel tube. Pumps used included the Aqua-Flo pumps such as the 56 frame, 3hp continuous (5hp peak) pumps that draw 11 1/2 amps on high speed at 230v. The 2HP Supercharger air system includes a high-pressure pump that pushes air into your jets. Having this feature installed means there is an air switch pack. Some systems had 2 speed Supercharge pumps. The plumbing is the barbed style of fittings that use hose clamps. They both glued and clamped the hoses to the PVC manifolds. See our extensive PVC manifold section to find the correct replacements for your Diamante Spa. Need a replacement circuit board or spa pack? See our 9700 HydroQuip control system selection such as the ECS 9400 and 9700 Series. The maximum temperature that can be adjusted on the control panel is 104F degrees. Some spas used a time clock with little tabs (each tab is 15 minutes). Others used the electronic control head or topside control panel. Replace the ozonator with a newer model by Del. See our hot tub ozonators for a great selection. Popular Diamante Spa models included Atlantis, Coronita, Grand Canyon, Ixtapa, Liberty, Mojave, Pharoh, Reyna, Sahara, San Augustine and San Felipe. Need Diamante Spa pillows? We offer some including the Chevron style pillow that measures 9 1/4 inches x 4 inches with a single peg on the back of pillows. See our pillows section for more. Contact us at support@HotTubOutpost.com if you need assistance in finding the right spa part or accessory for your Diamante Spas hot tub - send details/part number/even a picture along with your request if you like. We know you'll want to get back to enjoying your Diamante Spas hot tub, so we'll get back to you quickly. Hot Tub Outpost is an independent spa parts dealer and is not affiliated with the Diamante Spas.